FILE - U.S.Defense Secretary Jim Mattis speaks at the Pentagon, in Arlington, Virginia, near Washington, May 19, 2017. The U.S. has no evidence that the Syrian government recently has used deadly sarin nerve gas on its citizens but is looking into reports of its alleged use from people on the ground, U.S. Secretary of Defense Jim Mattis said Friday. “We’re looking for evidence of it since clearly we are dealing with the [Bashar al-]Assad regime that has used denial and deceit to hide their outlawed actions,” Mattis told reporters at the Pentagon. Syria has denied using illegal chemicals. Mattis said the Syrian government has weaponized and used chlorine gas in the Syrian civil war, and that the U.S. is “even more concerned about the possibility of sarin use.” The colorless toxin can cause respiratory failure, leading to death. 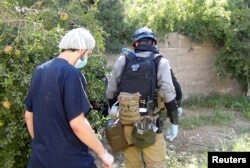 FILE - A U.N. chemical weapons expert (R) gathers evidence at one of the sites of an alleged poison gas attack in the southwestern Damascus suburb of Mouadamiya, Aug. 26, 2013. The United States is suspicious, Mattis said, because in addition to the reporting on the ground, the Assad government has been caught using chemical weapons against the Syrian people before. Last April, the U.S. military fired a barrage of missiles into Syria’s Shayrat Airfield in retaliation for a chemical weapons attack that killed about 100 civilians. Secretary of State Rex Tillerson said at the time the U.S. had "very high confidence" that the chemical agent used in that deadly attack was sarin nerve gas. “They’d be ill-advised to go back to violating the chemical convention,” Mattis said Friday, referring to the Convention on the Prohibition of the Development, Production, Stockpiling and Use of Chemical Weapons and on their Destruction.